Through the Health and Social Care Act 2010, local authorities and Clinical Commissioning Groups (CCGs) have equal and joint duties to prepare JSNAs and Joint Health and Wellbeing Strategies through the health and wellbeing board. Joint Health and Wellbeing Strategies are designed to address the needs identified in JSNA and set health and wellbeing priorities for local organisations. The commissioning plans of CCGs, NHS local teams, and local authorities are expected to be informed by relevant JSNAs and Joint Health and Wellbeing Strategies. Within these overarching priority areas are a number of more specific priorities, and progress and emerging priorities have been identified through updates to the strategy. Resilient – Supporting people and communities to become resilient by supporting voluntary and community groups, and creating opportunities for people to contribute. 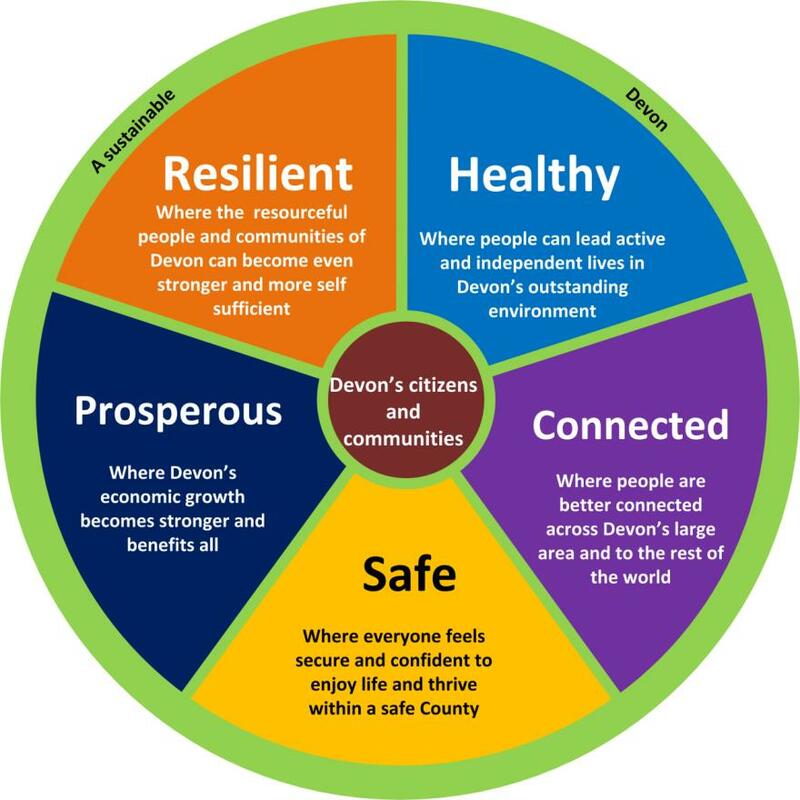 Healthy – Enabling people to lead healthy lives in Devon’s environment, supporting people to live in their own home as part of a supportive community, and focusing on reducing inequalities in health. Prosperous – Supporting Devon’s resourceful small enterprises, innovative high value businesses, agriculture and tourism industries and encouraging economic growth. Connected – Helping people to connect to one another in order to form supportive and inclusive communities through good digital and transport connections. Safe – Working to ensure everyone has the security, confidence and respect to live their life to the full, and where risks are present carefully targeting support to address the root causes of problems and offer protection from harm. Underlying this vision is the need for collaboration (working with the public and other organisations to achieve the best outcomes), being enterprising (achieving good value and working efficiently and effectively), and being innovative (working in new and flexible ways). There are also specific strategic priorities relating to particular areas of responsibility within the county council. The Adult Social Care Annual Report identifies current issues and priorities (https://new.devon.gov.uk/adultsocialcareandhealth/guide/adult-social-care-in-devon-2014-annual-report/). Further to this, the vision for care and support for vulnerable adults in Devon (https://new.devon.gov.uk/adultsocialcareandhealth/files/2012/11/Vision-of-care-and-support-for-vulnerable-adults-in-Devon.pdf?75ae0b) sets out how the County Council, its partners and the citizens of Devon will work together to build supportive communities and independent individuals. Annual Public Health Reports provide an overview of public health issues locally and set priorities for the year ahead. The Northern, Eastern and Western Devon CCG vision agreed by the governing body in 2013 is ‘healthy people, living healthy lives, in healthy communities’. Innovate to increase productivity and reduce waste. The South Devon and Torbay CCG vision as documented in the 2014 Strategic Plan is for ‘excellent, joined up care for everyone’. Leading a sustainable health and care system covering workforce, estates and IT.